SANTA ROSA, Calif.(October 29, 2018)—While local winegrape growers haven’t taken to dancing in the vineyards, this year’s dance with Mother Nature is one that will likely be fondly remembered. This season had an interesting but moderate mix of conditions. The year started slow with little pressure from the weather providing the grapes with a long hang time to develop ripeness and flavor maturity. In early October, Mother Nature delivered a quick tango of heavy rain causing some growers to harvest prior to the precipitation arriving. Luckily, the pending rain forecast prompted many growers to use canopy management techniques to open the fruit zone, allowing the sun and wind to dry out the remaining fruit. The season is winding down with a slow dance of warm days and cooler nights enabling the grapes to reach their optimal brix and pH. More than an inch of rain fell in the Russian River Valley in early October which set harvest back a few days. Once the weather cleared, growers have been hard at work picking grapes and the region’s harvest should be complete by or before Halloween. Most growers are reporting a large harvest with outstanding quality. While most Pinot Noir and Chardonnay is winding down, some Syrah remains to be picked. Growers are enthusiastic about the quality of grapes believing it has the makings of a great vintage. A mild growing season with relatively few heat spikes pushed the start of harvest about two weeks back compared to the past few years. This longer hang time was great for grapes and the mild temperatures kept the fruit from overripening. Cabernet again led off the harvest with yields running nearly 15% over estimates. Sauvignon Blanc and Pinot Noir appear to be coming in on average for quantity. Even though more than an inch of rain fell during the middle of harvest, it had no impact on Cabernet and little or no impact on Zinfandel grapes. Overall, fruit quality has been excellent with very little shrivel and little or no rot despite the rain. Dry Creek Valley growers are racing toward the finish line with about 90% of the harvest complete and the remaining grapes should be picked within the next week. 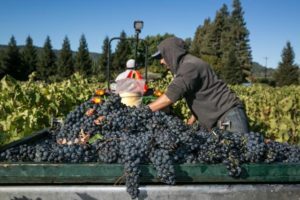 According to reports, the region is approximately 75% through harvest with one or two more valley vineyards to pick the first week of November. Tanks will likely be empty by Thanksgiving. 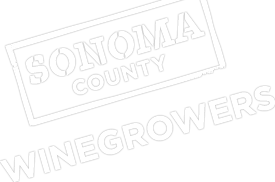 This could go down as one of the longest, slowest harvest Sonoma Valley growers have experienced in years as there were no heat spikes but a lot of moderate daytime temperatures and cool nights. The grape quality has been exceptional across many varieties. One reason is that this year the pH level has stayed low and the acids have stayed higher for longer period. As a result, grapes have mature flavors without overripe fruit which could make it a magical year for winemakers. A decent amount of Cabernet Sauvignon remains to be harvested with most other varieties completed or near completion. This year has the all the makings of a great vintage. Some varieties really produced heavily this year while overall the harvest should be slightly above initial estimates. Throughout the county, fruit quality has been excellent due to the superb growing season and late harvest. Have the recent rains affected the grapes? The rains seemed to affect the grape farmers and vineyard workers more than the grapes. The rain was surprisingly heavy for this time of year with some areas in the county reporting 2” of rain and most areas reporting more than 1” fell. Fortunately, the weather warmed up and a nice wind blew following the storm which minimized most damage.